Once in a great while we might find ourselves in a situation where we have a little extra cash in our pockets. For many of us that time comes around income tax refund time. For others it could be a won settlement. But the source of this extra money isn’t the focus here; it’s what you the consumer do with this extra money when you have it. The initial feeling is to blow it, spending it recklessly because it’s not part of your typical income. My goal is that after reading this piece, people will have the tools to curb that urge to splurge and still feel good about themselves. The following is 12 rules I’ve put together to accomplish just that. #1: Avoid window shopping. This rule includes both avoiding attractive store fronts and also browsing while in the store. If it’s not something you “need”, why torture yourself to begin with? #2: Use cash not credit. It’s a lot tougher to part with a $20 bill for example than it is to swipe a piece of plastic that goes right back in your wallet. By physically relinquishing something of value, it causes us to rethink unnecessary purchases. #3 & #4: Give yourself 72 hours to think over a purchase. This may seem like a long time, but if you’re a compulsive shopper, it may take that long to reconsider or forget about the purchase altogether. Then, if you’re afraid of losing that got-to-have item within those 72 hours, there’s usually an option of layaway. #5: If clothes and shoes are your weakness, rummage through your closet first. Those of us that like to splurge probably have a track record of doing so. That said, go through your closet; you’ll probably discover an item you haven’t worn in a while and dust it off. #6: Put a post-it note on credit cards, your computer, or your checkbook to remind yourself of outstanding debts/responsibilities. A post-it could just be the extra added oomph needed to remind us of our priorities. #7: Give up something in trade. What this means is if you want something new, you have to let go of something you already have. This is a great rule as it serves two functions. One, we cut down on clutter. And two, you are much less likely to buy something new if you have to do away with something else you own first. #8: Make lists. This can apply to anything really, but none more so than grocery shopping. Statistics show that shoppers without a list spend anywhere from 20-50% more at the store than someone with a list. Impulse buying is the ugly cousin to splurging. Have a list ready for any shopping excursion, and save some money and heartache. #9: Set goals for that extra money. By having a big expenditure on the horizon, and making a commitment to reach that horizon, you’re less likely to throw away money on lesser more immediate gratifications. #10: Never go shopping while in an emotional state. When emotions run high, often times the total cost at the check out line does too. 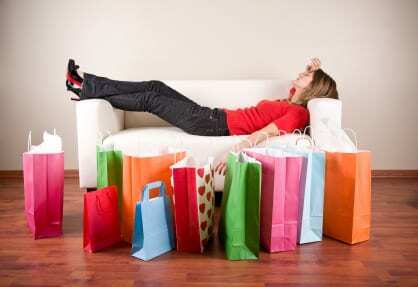 Being sad or depressed while shopping is particularly dangerous. The high we get, that scrap of happiness we feel from a fresh purchase; though it feels good at the moment, often only sustains us long enough to reach our vehicles. By then, it’s too late. Start with a good mood, and you’re more apt to stick to buying only what you need. #11: Don’t confuse a price tag for self-worth. In relation to rule #10, buying something pricey versus the same item at half the cost, won’t make you feel any richer. What you buy is not a reflection of who you are as a person. A pair of thrift store jeans can look just as good (if not better) than $100 jeans from a high priced retailer. #12: Unsubscribe to catalogues. What starts as junk mail can turn into a shopaholic’s paradise within no time at all. Get rid of that temptation by once again treating those magazines and catalogues as junk mail. But don’t forget to unsubscribe so that those pesky temptations don’t return. Perhaps these rules do take the fun out of having a little extra money on hand, but in the long run, saving that money can be much more gratifying. Plus, no one said you can’t spend it; just be smart about it. By following these rules you too can turn splurging into conserving.